Today at 07.00 the around 50.000 polling stations around the country opened, and will remain open for people to vote until 22.00 tonight. The election is a vote for MPs and 650 new MPs are to be elected. More than 50 million people are registered to vote this year. As well as the general election more than 9000 are being contested across th UK. It’s reckoned the first results will be in by midnight and the final results Friday night. 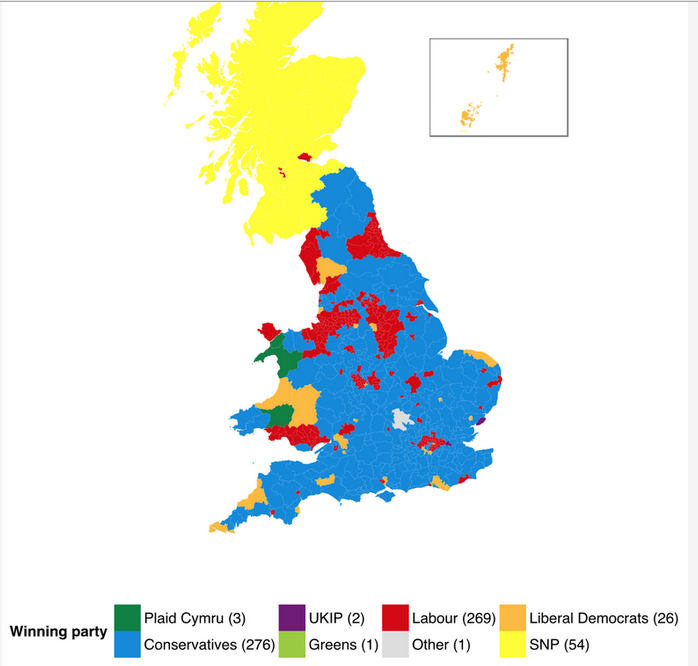 A map showing an interesting turn from previous elections. The Scottish nationalists seem to make a clean sweep in Scotland. This probably has a lot to do with the referendum last autumn. Furthermore we see from the map that there are no contenders to the two major parties. However they might struggle to get more than 50% of the votes this year. This is very uncommon in British elections. Therefor I can’t say for sure who I believe will be the next prime minister, but I am absolutely certain that it will be either David Cameron or Ed Miliband. You were right about that! And the success of the Scotish national party!